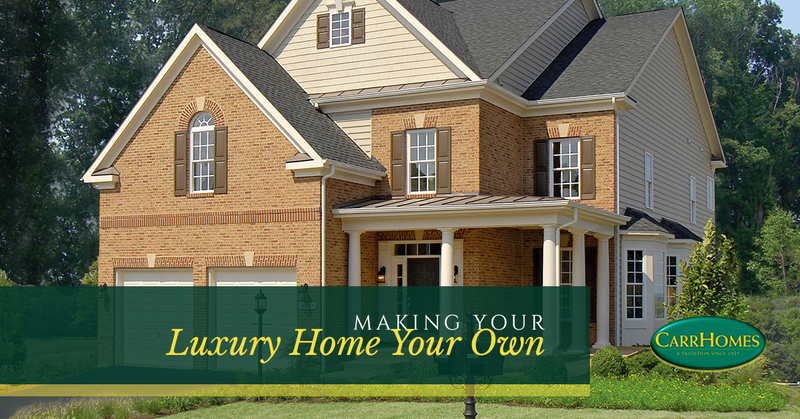 Purchasing your first (or second) luxury home can be quite the daunting task. Particularly, if your current or previous home doesn’t offer nearly the same comfort, style, or luxury as our numerous models, upgrading to one of CarrHomes’ elegant properties can seem like a big leap. Each CarrHomes models is poised to provide you and your family with unparalleled amenities and comfort, affording you and yours the lifestyle you deserve. While each property offers unique craftsmanship, style, and features, making a CarrHomes property your home is never a difficult task. With generously-sized bathrooms, spellbinding bedrooms, amply-spaced living rooms, and inviting entry ways, each CarrHomes model offers nothing short of interior customizability, ensuring you and your family create a home that is uniquely yours. And while creating and crafting your personalized is an exciting endeavor, we at CarrHomes understand that this can also add a deal of stress to your moving or building experience. Accordingly, we’ve compiled a few tips for making the most out of your new luxury home. Read on to learn more about utilizing and enjoying every foot of space in your new CarrHomes Home. There are myriad ways in which families create a living space that is uniquely their own; some communicate their desires for specific colors, patterns, and flooring, while others seek to add art, paintings, or family portraits to their walls; other dedicate entire rooms to music, arts, and other creative pursuits, while some choose to adorn their walls with hunting trophies, rifles, and memories of weekends in the woods. These ideas are but the tip of the iceberg when it comes to the customization options available to you and your family; each CarrHomes property affords you and yours the opportunity to not only expand your family’s creativity, but to spend more time together while customizing your living spaces. One of CarrHomes’ newest properties, Saratoga Towns offers residents the comfort of luxury homes just a ways from the District. These spacious townhomes offer numerous options for creating your own unique space. With each home offering either a three- or four-level layout, up to five bedroom and three-and-a-half baths, our Saratoga Towns models are sure to get the creative juices flowing. Moreover, each upper level room offers generous nine-foot ceilings — perfect for an art space for the kids, or a tempting spot for more lavish decoration, art, or photos. Should the former scenario occur, clean-up is a snap; our walk-in “dream” shower is available as an upgrade option in our lavish Owner’s Spa. Offering residents up to five acres of property situated amidst lush woodlands, our Clifton Point properties are perfect for incorporating nature into your luxury home. With each model boasting between four and six bedrooms and three- or four-car garages, respectively, the options for utilizing your space are seemingly endless. Don’t have three or four cars? Not an issue; our generously-sized garages make the perfect craft space or music space for the aspiring drummer in your family who needs a bit of distance from the rest of the house. However, if you’re proud of your growing car collection, these garages are large enough to hold a handful of your prized rides. Some homes should immediately exude a sense of calm, comfort, and luxury upon entry. Accordingly, very property within the Meadows at Great Falls community boasts a grand, two-storey entrance, making your home all the more inviting for not only you and your family, but the numerous guests that are sure to flood your home during events and holidays. No matter the number of friends and family who visit your home, their first impressions are sure to be positively impactful; with nine- to eleven-foot ceilings, your home will feel even larger than its generous 4,100-10,000 square feet reveals. With ample options and space for creativity or decoration, adding your fingerprint to your luxury home is simple. Looking to add even more options for your future home at the Meadows at Great Falls? Our GALA Award-winning Lancaster model is offered with an optional side conservatory, allowing for additional space, creativity, or simply an additional room for those slow, relaxing Sunday mornings. With each home offering residents up to 10,000 square feet on one-acre homesites, our unique homes at Waterford Creek provide near-infinite possibilities for making each interior space truly your own. Each home in our Waterford Creek community is complete with attractive hardwood flooring in the foyer, gallery, powder room, and breakfast room, making these rooms perfect for your and your family’s unique style, wants, and needs. And no CarrHomes property is complete without our large, nine- to eleven-foot ceilings, creating a living space that adds a cavernous sense of calm. Additionally, our homes at Waterford Creek are one of the only new communities in the area that are wired for Comcast cable and high-speed Internet. Living amongst the rolling hills that make up part of Virginia’s wine region is but one of the great pleasures of living in Purcellville. However, living in a CarrHomes luxury home in our Loudoun Oaks community makes being nestled amidst Purcellville’s beautiful scenery an additional luxury. With each home offering four bedrooms and three-and-a-half to four-and-a-half baths, each home that makes up our Loudoun Oaks community brings you the space and comfort you desire in a luxury home. Further, each home is fitted with brushed nickel light fixtures and attractive, elegant bedroom and bathroom fixtures throughout the home. With amply-spaced rooms and nine- to eleven-foot ceilings, your and your family’s collective creativity has the space to burst and bloom. While we’ve laid out but a few of the many unique features offered in each CarrHomes luxury home, options for adding your personal touch abound within each CarrHomes property. Specifically, we’re proud to have crafted countless homes over our near-100- year tenure as Virginia’s finest luxury home builders. Since 1925, CarrHomes has provided the Greater Washington area with quality luxury homes that remain unrivaled in the area, attracting families and homeowners from all over the country. Our legacy is steadfastly built on traditions of location, design, and craftsmanship, offering homeowners the utmost in luxury homeownership. By constructing luxury homes of only the finest and most modern materials, CarrHomes is proud to offer the highest quality luxury homes in the Greater Washington area. If you have any questions, comments, or concerns about any of CarrHomes luxury homesites and properties, please don’t hesitate to reach out to us, as we’re always happy to hear from future homeowners and community members.